Engine: 7-cyl 1680bhp/1253kW Mirrlees KSSMR oil engine by Mirrlees National Ltd, Stockport. CP propeller. 1966: Launched by Hall, Russell & Co Ltd, Aberdeen (Yd.No.931) for J. Marr & Son Ltd, Fleetwood as CRISCILLA. 11.1966: Completed. 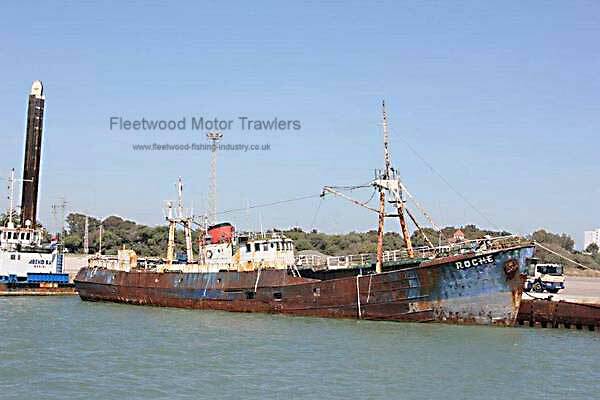 Registered at Fleetwood (FD261). 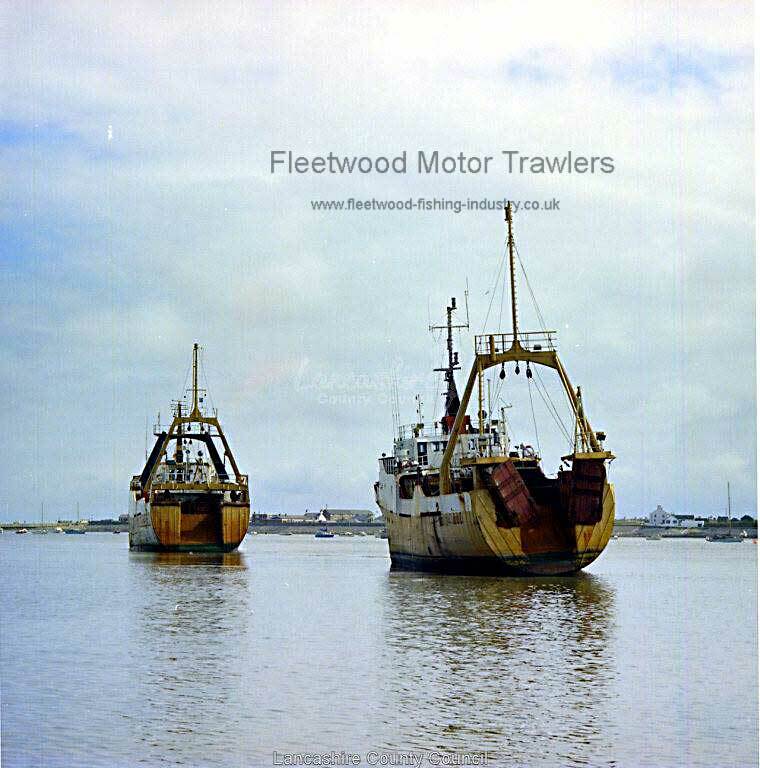 23.06.1969: Transferred to fish out of Hull. 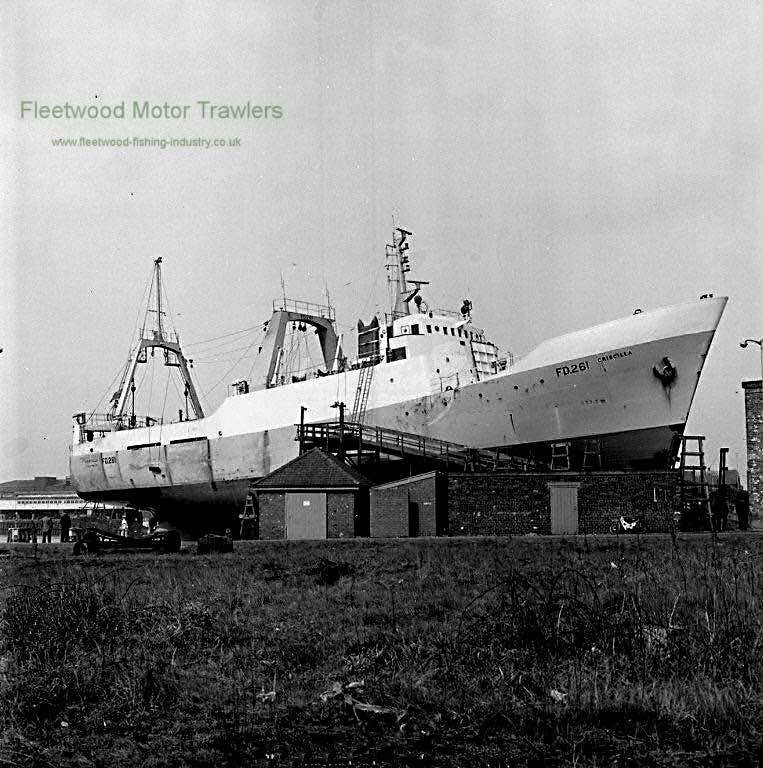 10.10.1969: Transferred to fish out of Fleetwood. 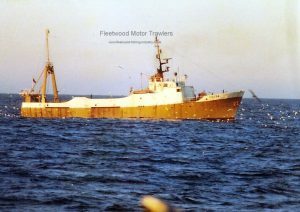 03.1976: Last trip out of Fleetwood, landed at Hull 53 days out, 5,549 blocks. 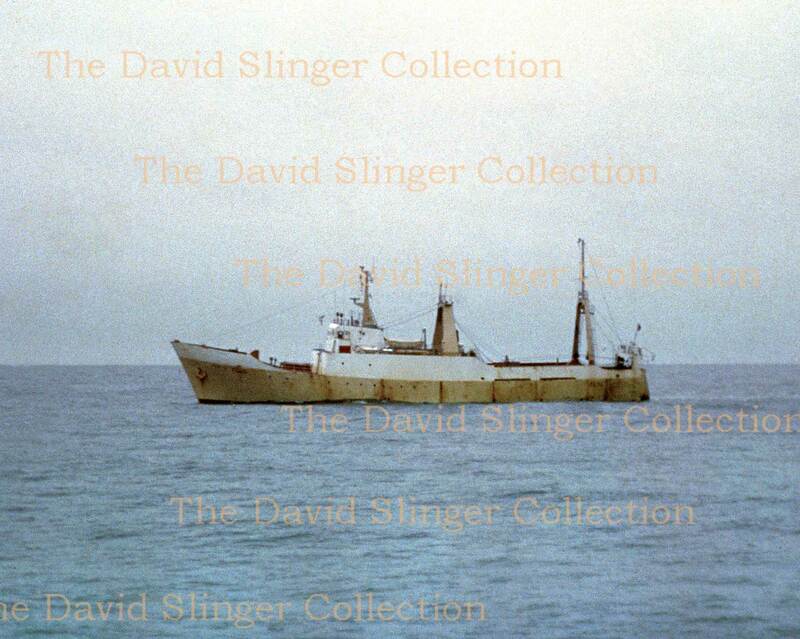 28.03.1978: Engaged in offshore rig support. 1978: Returned to fishing out of Hull. 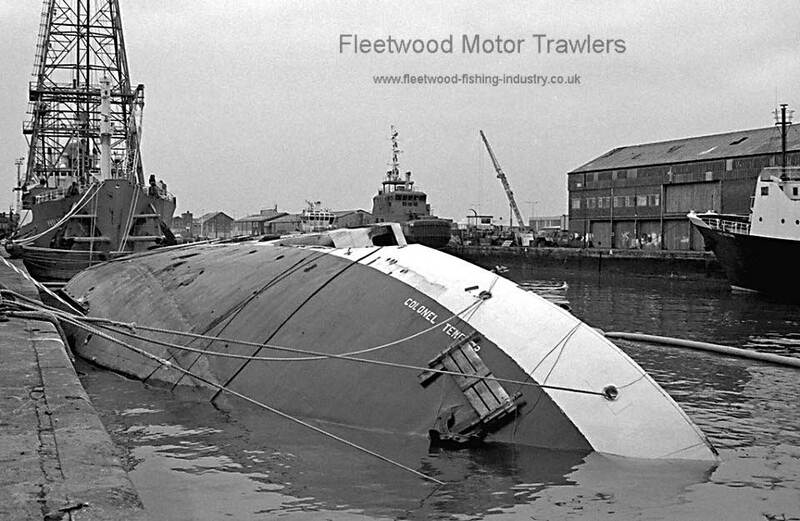 1978: Sold to Royal Aircraft Establishment, Farnborough. 1978: Converted by Globe Shiprepairers Ltd, Hull to an acoustic research/survey vessel/ fitted with moonpool and accommodation for 12 scientists. 1980: Fleetwood registry closed. Renamed COLONEL TEMPLER. 1989: Transferred to Defence Evaluation & Research Agency (DERA), Farnborough. 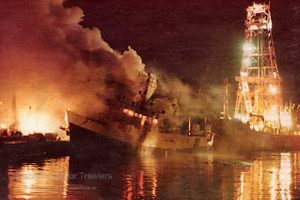 22.1.1991: At Hull during conversion work caught fire caused by a burner cutting a hole in a bulkhead and no fire watcher. Owing to the severity of the fire, deliberately flooded to extinguish fire and capsized at the dockside. Righted, salved and placed in dry dock for refurbishment and major rebuild. 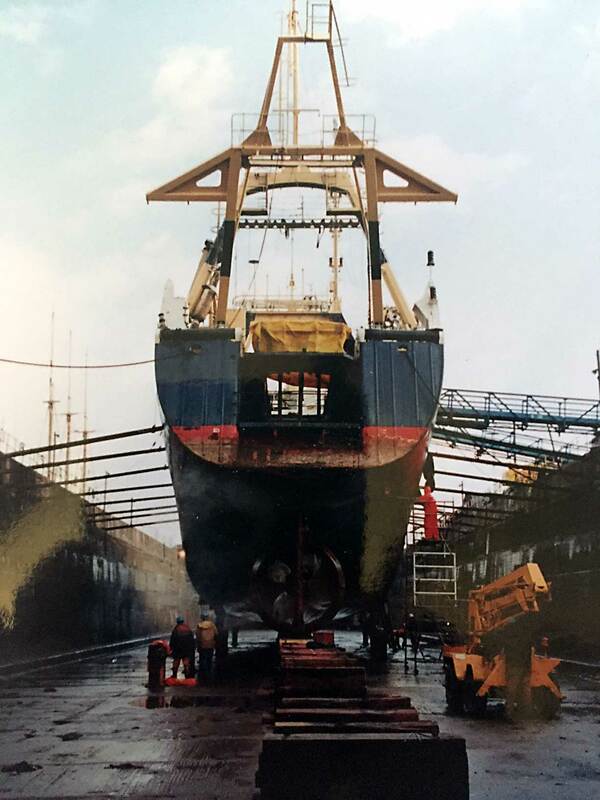 1990/1: Major rebuild by Globe Shiprepairers Ltd, Hull and repair to fire damage. 8.1992: Following Special Survey, remeasured 1005g 301n. 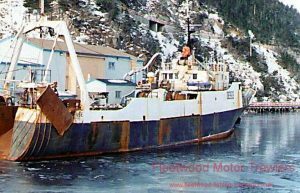 4.1997: Converted to diesel electric propulsion. Oil engines 2 x 12-cyl vee total 2738bhp/2014kW Cummins by Cummins Engine Co Inc, Columbus, IN. 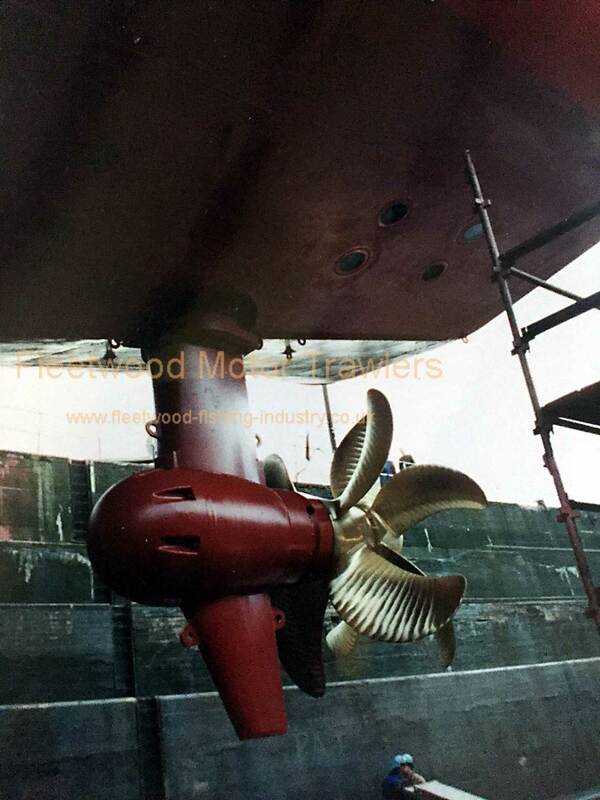 Coupled to 2 x gen sets 1007kW 600V a.c. driving electric motor 1800shp/1324kW. 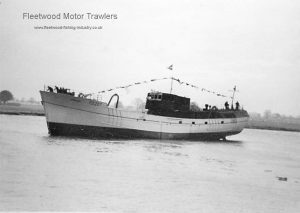 Fitted with a contra rotating azimuthing propeller. 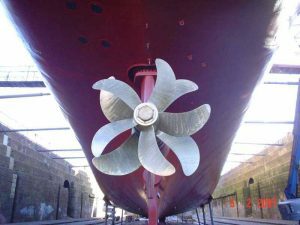 First vessel under Lloyds to be classed unlimited service with such single propulsion system. 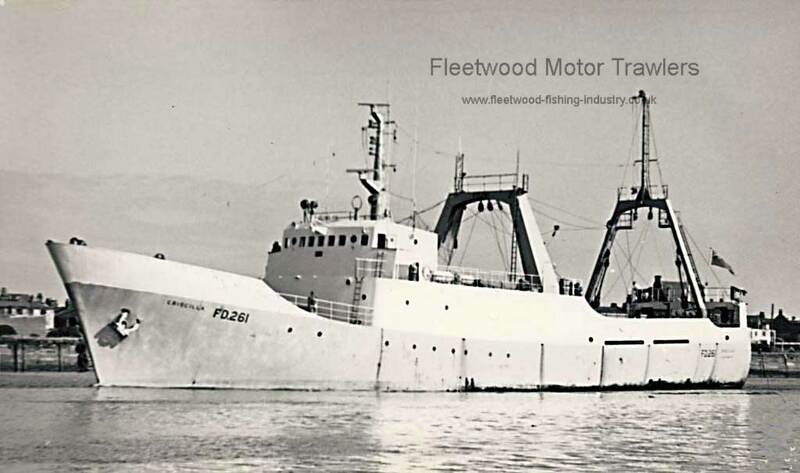 2000: Transferred to Government of the United Kingdom (Ministry of Defence), London – Royal Maritime Auxiliary Service (RMAS) (P.No.A229). Serco Denholm Ltd, Greenock designated managers. 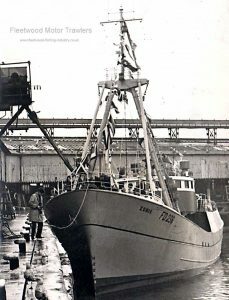 Employed in support of UK Armed Forces. 2001: Converted for diving support. 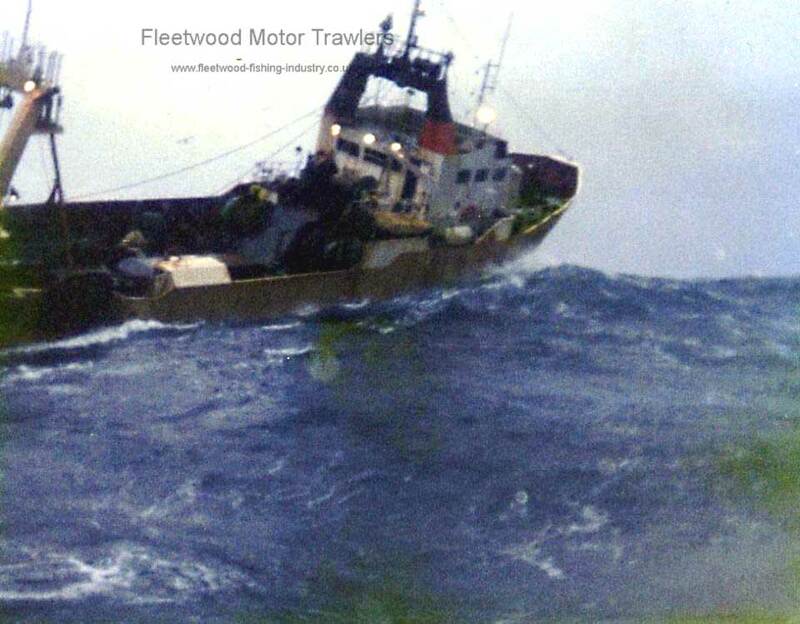 3.2008: Transferred to Serco Marine Services Ltd, Greenock. 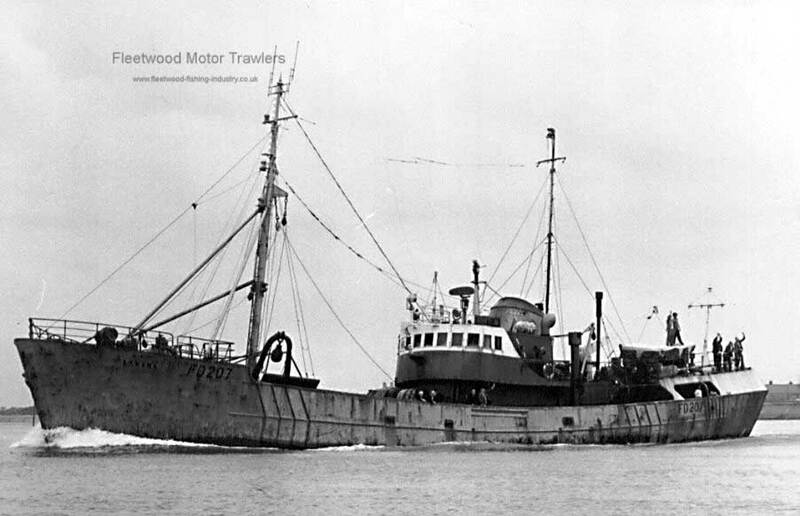 Renamed SD COLONEL TEMPLER. 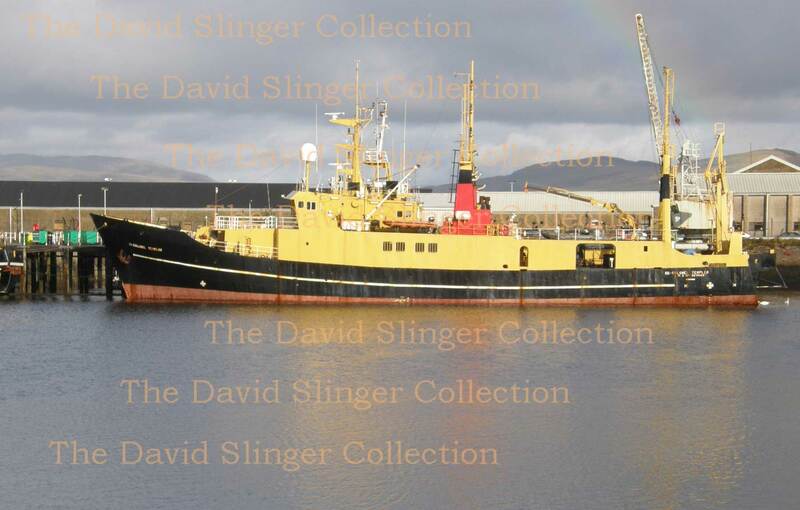 2011: Laid up in Great Harbour, Greenock, on sales list. 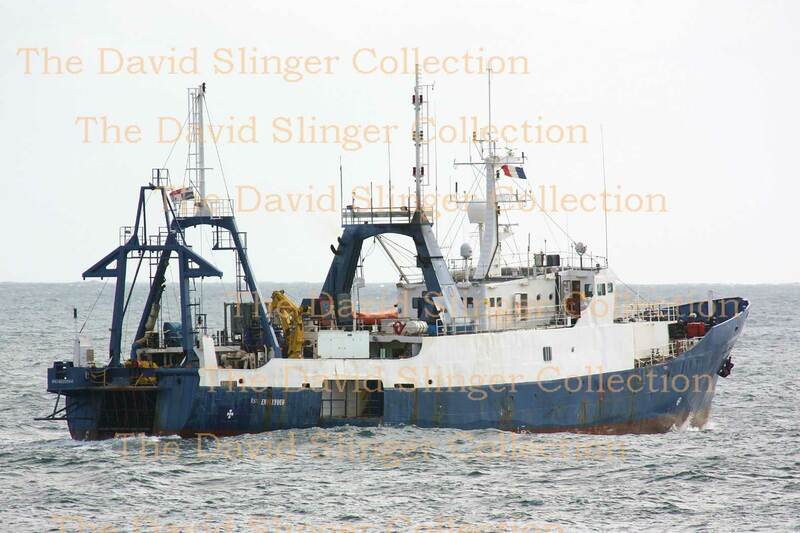 10.2011: Sold to Seaways Survey & Recovery Ltd, Miami, FL, USA. 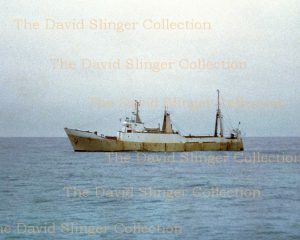 Seaway Offshore Inc, Miami designated managers. 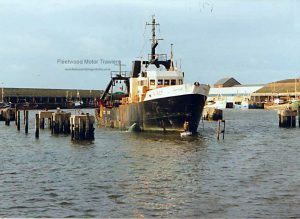 By 10.2011: Registered at Panama as SEAWAY ENDEAVOUR. By 04.2012: Registered at Panama as RSV ENDEAVOUR. 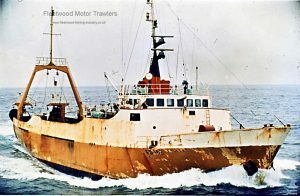 By 11.2012: Registered at Lome, Togo as ENDEAVOUR. 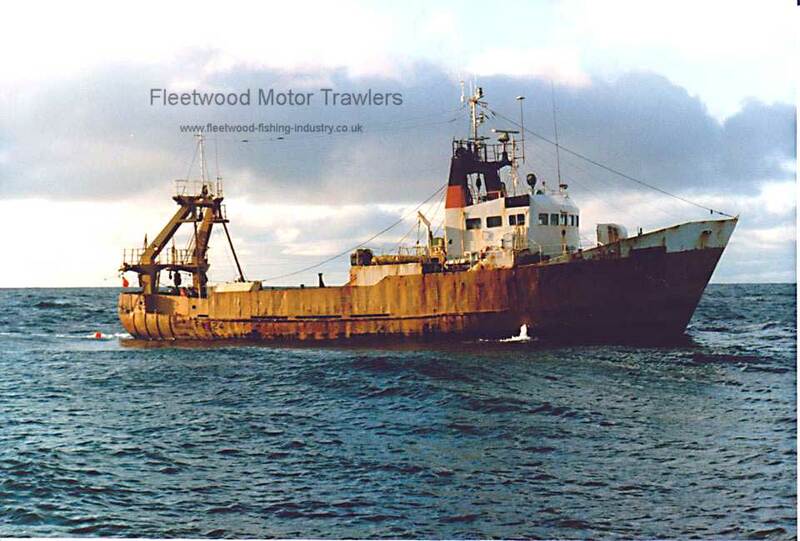 2015: Sold to Halstorm Investment Group. 23.11.2016: Laid up in Glasgow. 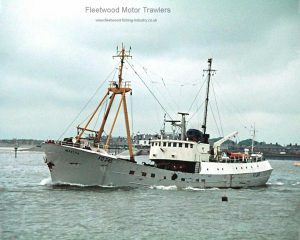 The only stern trawler built specifically to operate out of Fleetwood and the largest ever Fleetwood registered fishing vessel. 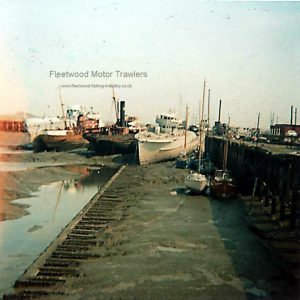 Her build took account of the width of the Fleetwood lock gates. 11/10/2016: Page re-published due to site problems. 14/05/2017: Removed FMHT watermarks from images. 10/08/2018: Added more images of the refurbishment. 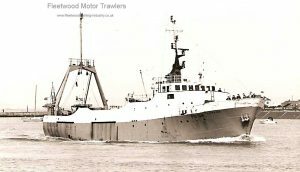 This entry was posted in Marr, Motor Trawler on 11th October 2016 by William Brixham. 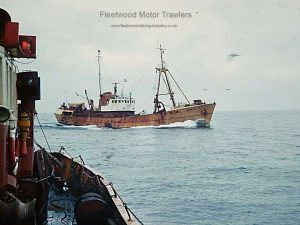 1965: To Fleetwood as a new vessel. 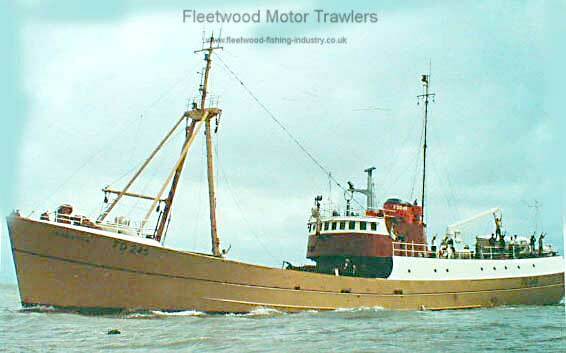 Top Fleetwood trawler for her class under Sid Christy. 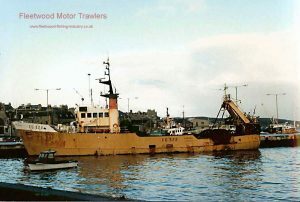 06.07.1977: Sold to Kalealo Enterprises, Tema, Ghana and renamed MADDEN MARR. 1979: The trawler was declared a total loss after running aground during a dramatic rescue bid off the Ghanian coast. 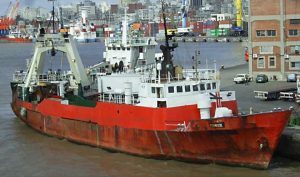 The ship hit a bar near the entrance to Tema harbour whilst attempting to help another trawler being operated by the same company. The other trawler involved was the ‘SEA EAGLE’, a former Polish trawler. 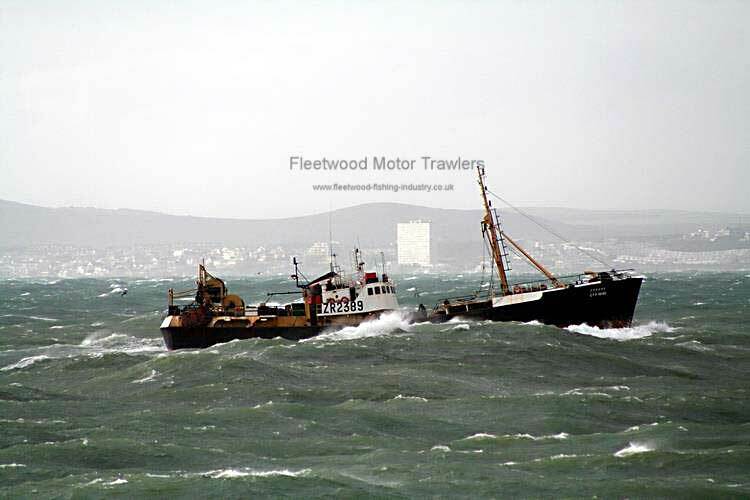 This vessel was reported to be on fire and in need of assistance. 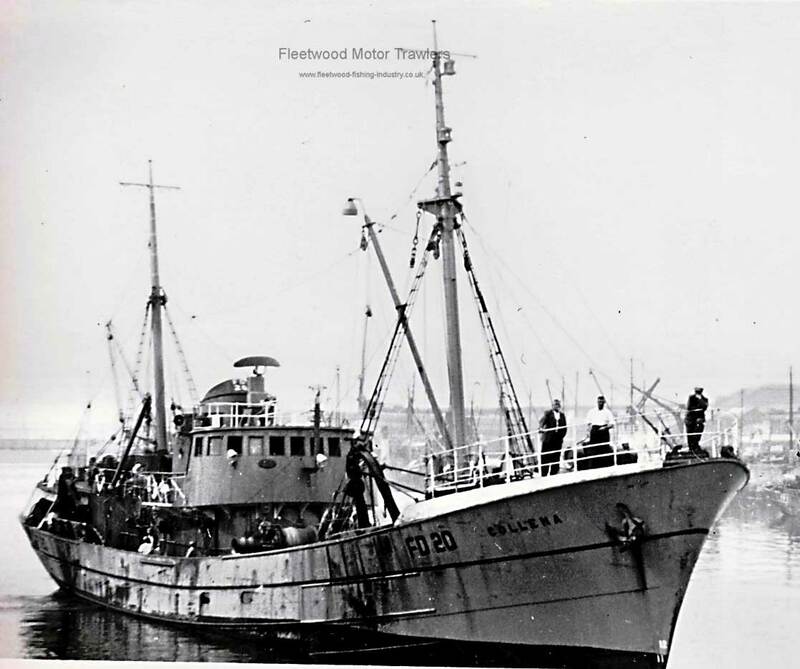 MARETTA attempted to rescue the ship but in doing so she herself ran into difficulties. As a result she ended up a total loss. 10/10/2016: Page re-published due to site problems. 30/03/2017: Added image and removed FMHT watermarks. 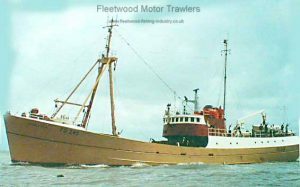 This entry was posted in Lost, Marr, Motor Trawler on 10th October 2016 by Howard Small. 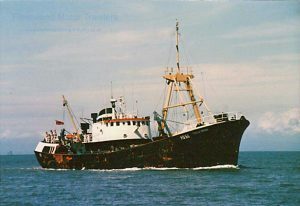 1979 sold to Aberdeen and renamed GRAMPIAN HUNTER (A85). 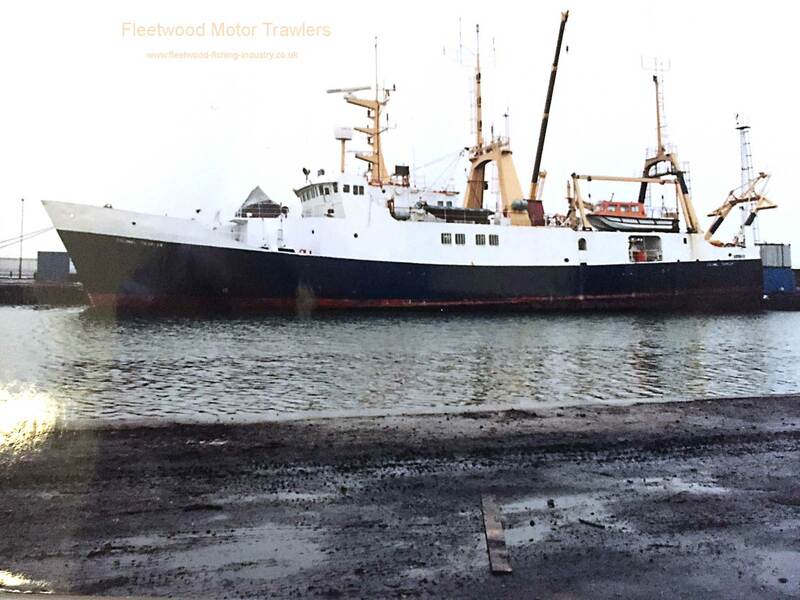 1987 sold to David Atkinson and renamed STELLA ORION and re-registered at Fleetwood as FD58. 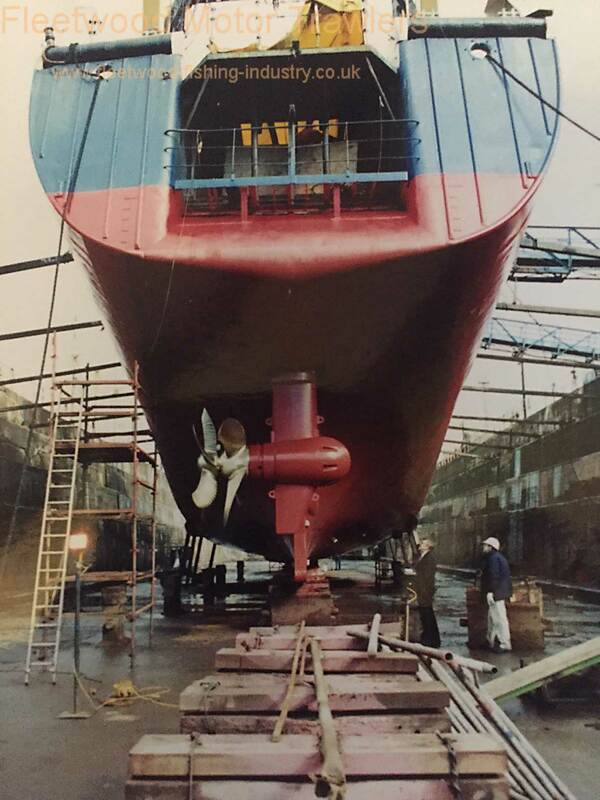 1987: Sold to Spain and rebuilt with part shelterdeck. 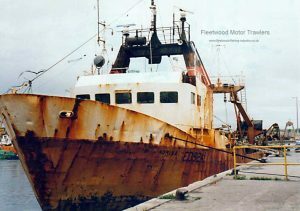 2010: Berthed at Puerto de Santa Maria (as ROCHE) in the Cadiz province, after being used as a fish carrier out of Morocco. 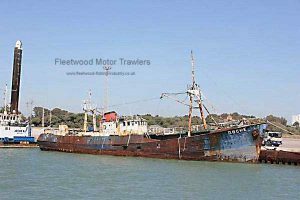 31/03/2017: Image added and FMHT watermark removed. This entry was posted in Marr, Motor Trawler on 10th October 2016 by Howard Small. 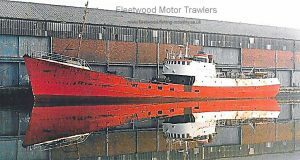 Built: Drypool Engineering & Dry Dock Co Ltd, Hull. 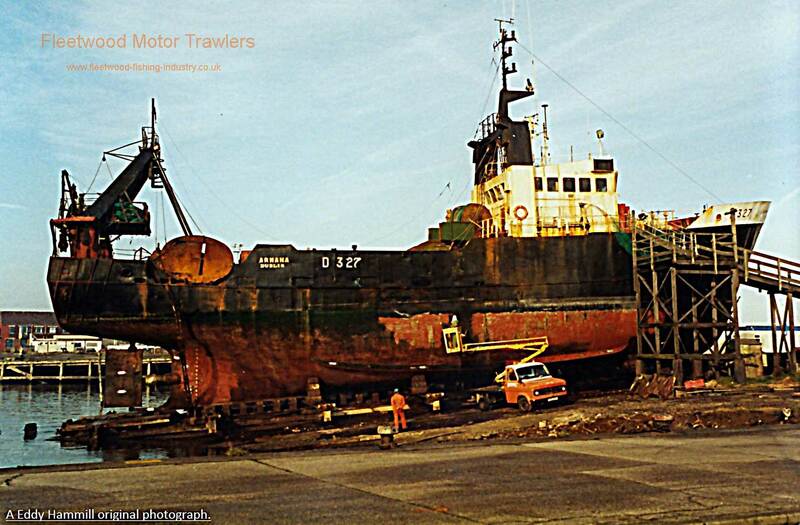 1976: Completed by Drypool Engineering and Dry Dock Co Ltd Hull, (Yd. No. 1563 as ARMANA. 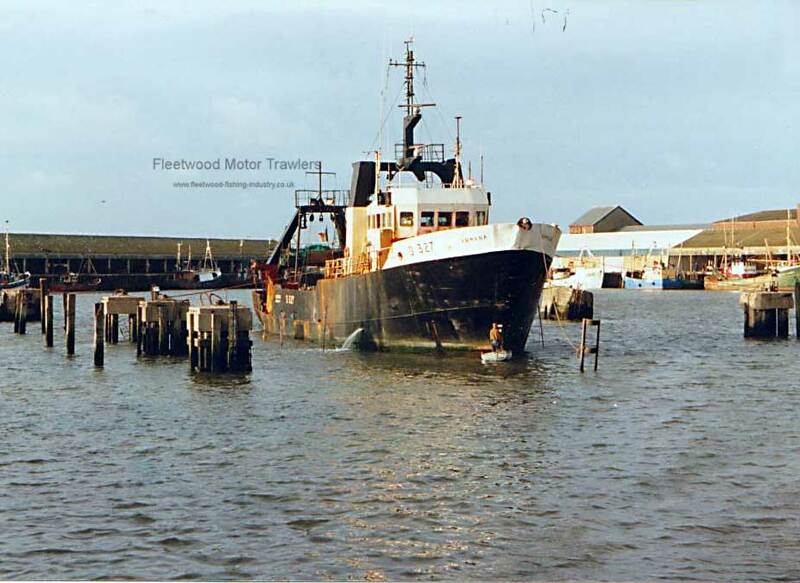 06.06.1976: Registered at Fleetwood (FD322). 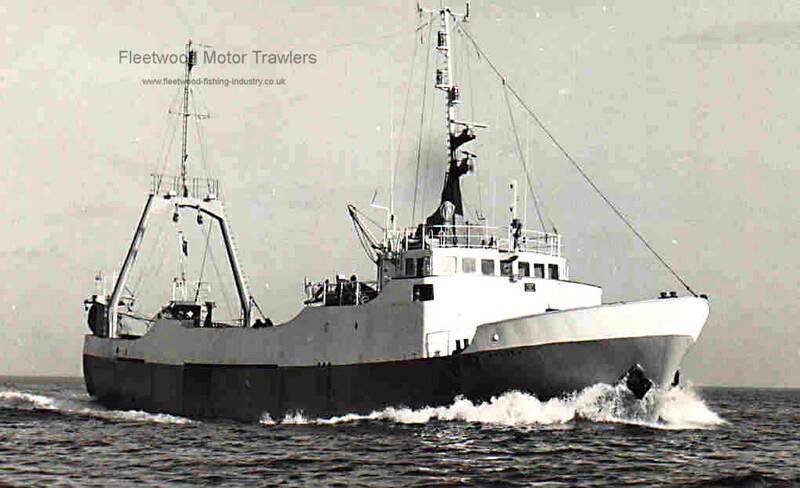 08.1978: Two weeks mine-sweeping exercises in the Clyde estuary. 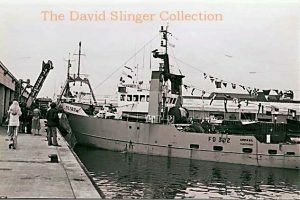 07.1982: One of the Company’s 8 wet fish trawlers transferred to Hull (FD322). 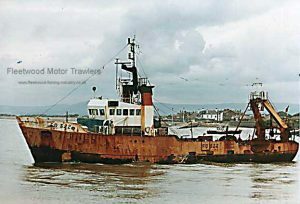 06.07.1987: Sold to Armana Ltd Hull (FD322). 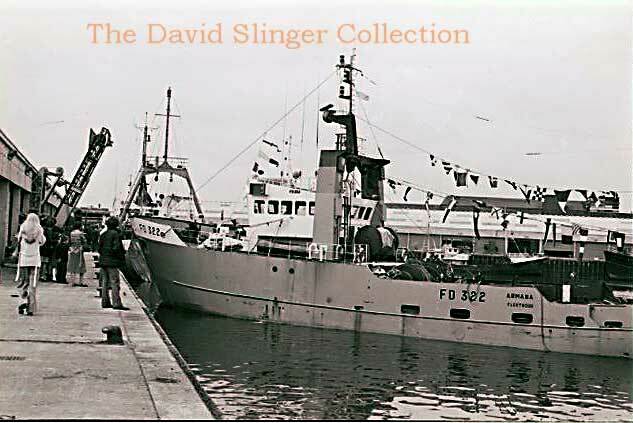 06.1994: Sold to Donegal Deep Sea Fishing Co Ltd Dublin Eire. 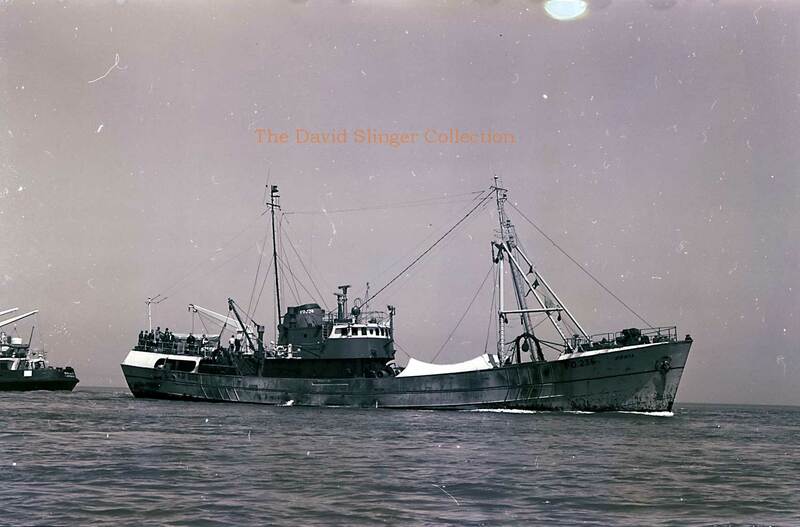 Registry transferred to Dublin (D327). 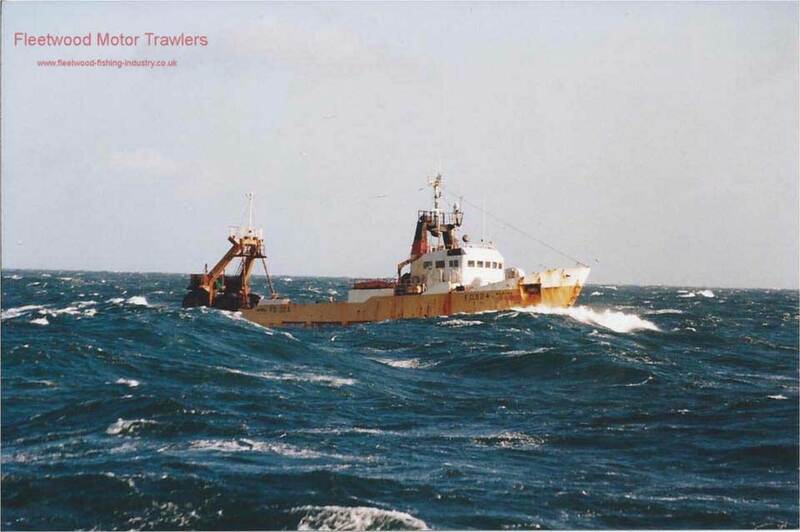 The Armana with skipper Malcolm Trott was the first trawler to gross over £1 million in a calender year. Fishing Home waters landed a total of 30,059 kits from 22 trips -320 days at sea. 06/10/2016: Page re-published due to site problems. 24/09/2017: Removed FMHT watermark and added an image. 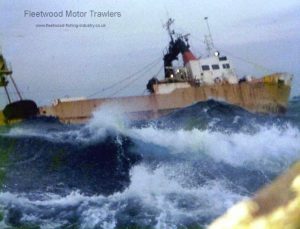 This entry was posted in Marr, Motor Trawler on 6th October 2016 by Howard Small. 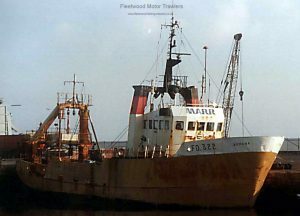 December 11 1961: Launched by Goole Shipbuilding & Repairing Co Ltd, Goole (Yd.No.530) for J. Marr & Son Ltd, Fleetwood as ARMANA. March 1962: Completed. 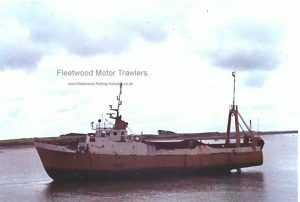 Registered at Fleetwood (FD207). 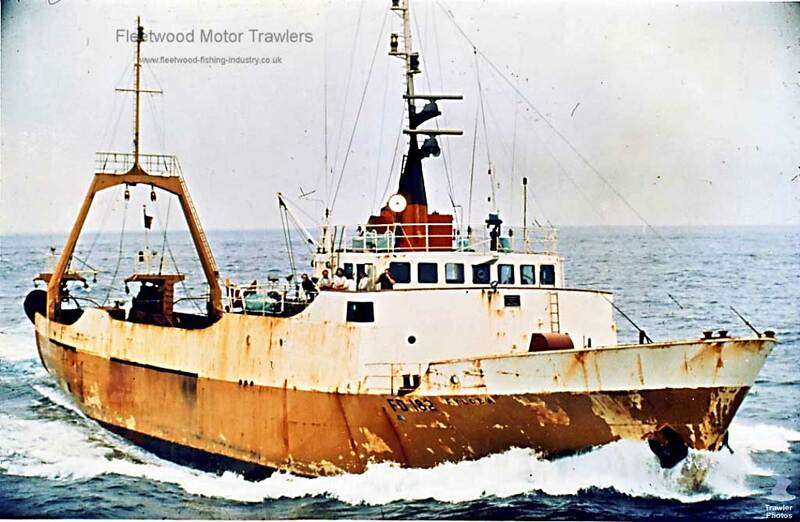 1969: Sold to Irvin & Johnson Ltd, Cape Town. Registered at Cape Town (CTA294). 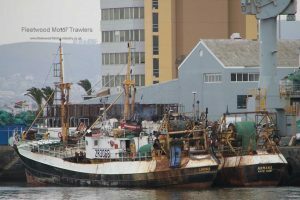 2009: Seen in Cape Town Fish Dock 26th March. Looked active and in good shape. Modified with extended shelter deck port side. 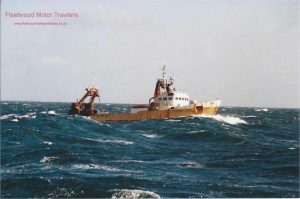 October 2011: Still operating from Cape Town. 21/08/2017: Removed FMHT watermark and added an image. 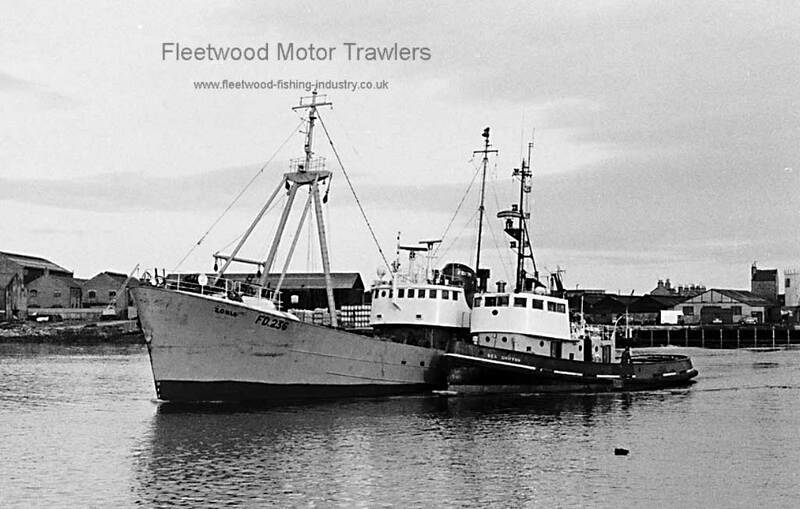 1955: Completed by Cochrane & Sons Ltd, Selby for J Marr & Son Ltd, Fleetwood as COLLENA. 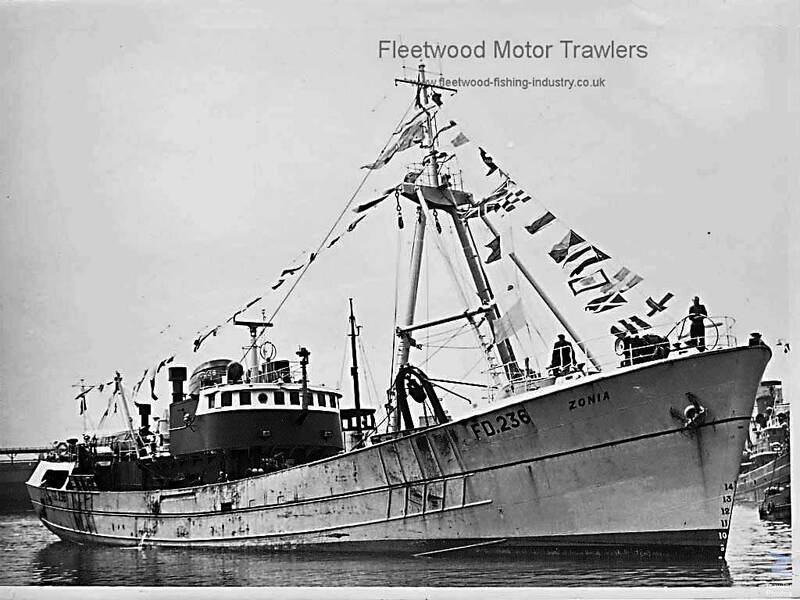 First of three middle water trawlers ordered in 1954 with more powerful engines contract cost per vessels £125,000. 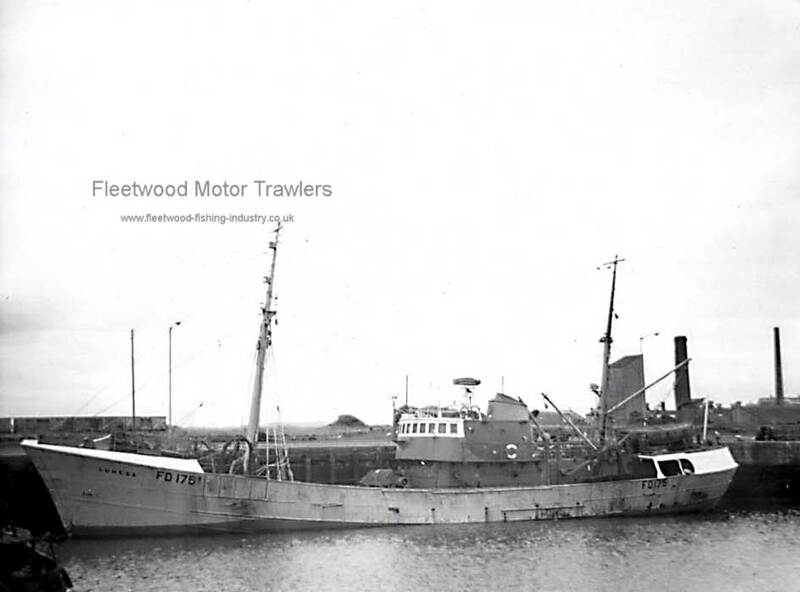 23.02.1955: Registered at Fleetwood (FD20). 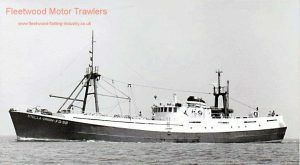 20.01.1964: Renamed VELIA taking the name from the Marr’s trawler VELIA (296 gt /b1952) which had been sold to Italian owners. Change prompted by radio traffic confusion with CORENA. 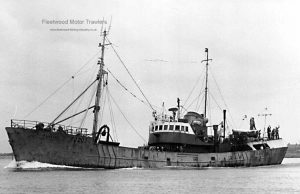 06.1971: Suffered major engine damage on the Icelandic grounds. 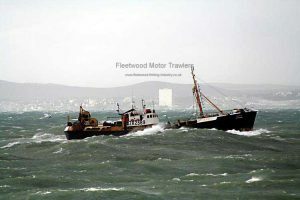 Towed home and laid up. 03.1972: Sold to to H Kitson Vickers & Sons (Engineers) Ltd, Sheffield. 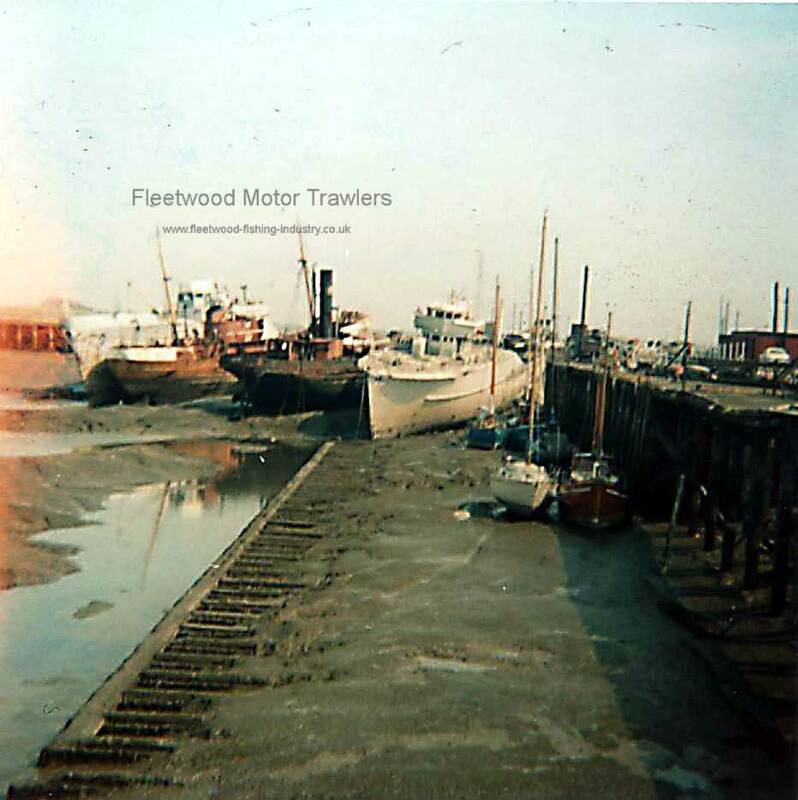 08.1972: Commenced breaking up at Fleetwood. 05/10/2016: Page re-published due to site problems. 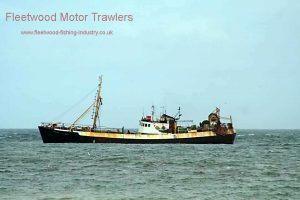 This entry was posted in Marr, Motor Trawler on 5th October 2016 by Howard Small. 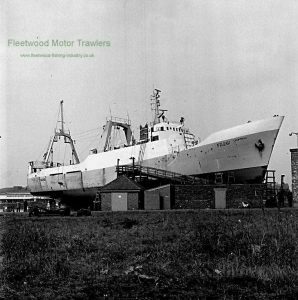 1975: Completed by Goole Shipbuilding & Repair Co Ltd (Yd. No. 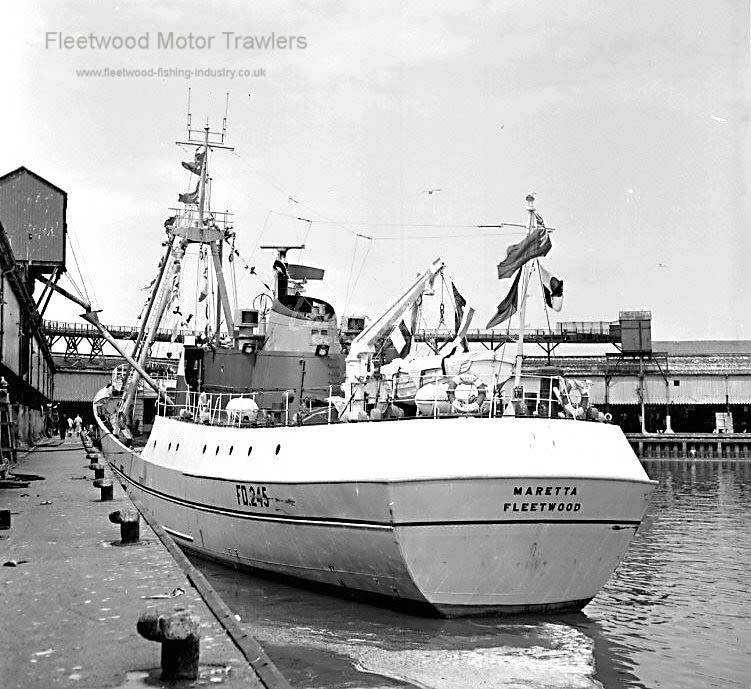 585) for J Marr & Sons Ltd, Fleetwood as NORINA. 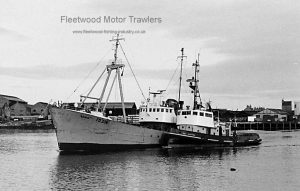 Registered at Fleetwood (FD 324). 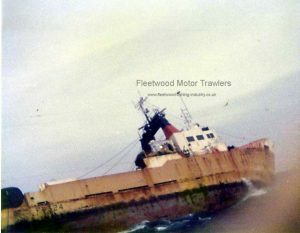 1982: Transferred to Norina Ltd Hull, (part of the Marrs Group). 2002: Sold by Norina Ltd, Hull (Marr Fishing Vessel Management Ltd, managers) to Anglo-Spanish principals. Renamed CARUMA. 2002: Sold to Mystero Ltd, London (Anglo-Spanish principals) (Hooktone Ltd, Troon, agents). Renamed JOHN-LOREN, reclassed and registered at Troon (TN100). 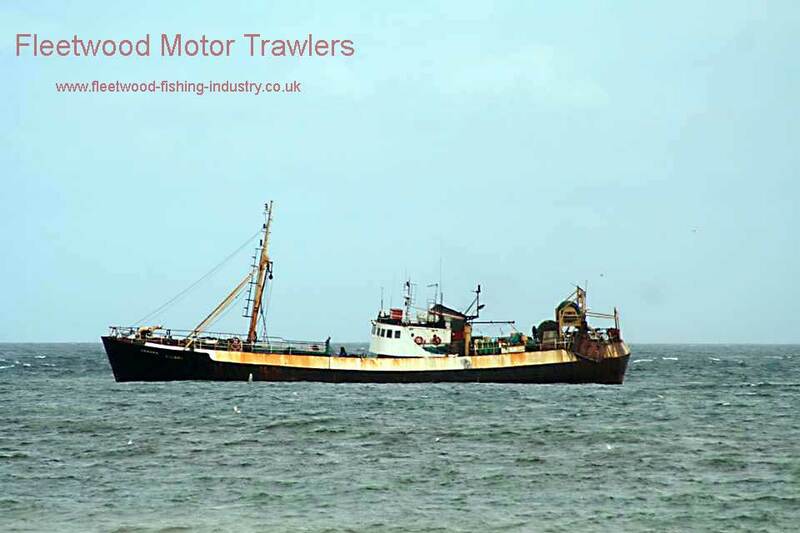 Owners currently are: Joincode Ltd, Troon (Intermediaria Pesquera Gallega, La Coruna, managers). 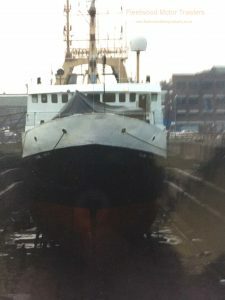 Vessel generally lands in Spain. 01/10/2017: Removed FMHT watermark from image and added new pictures. Engine: 4 stroke V.12-cyl 1900bhp/1417kW by Ruston Paxman Diesels Ltd, Newton-le-Willows. 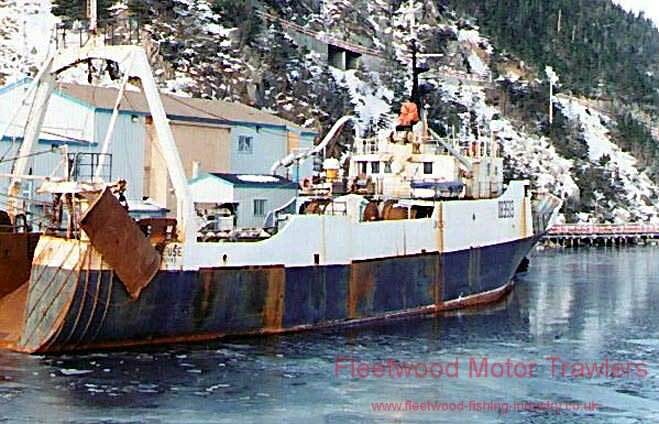 1979: Sold to Bonavista Cold Storage Co Ltd, St. John’s, Newfoundland. 1980: Renamed FERMEUSE. Registered at St. John’s. 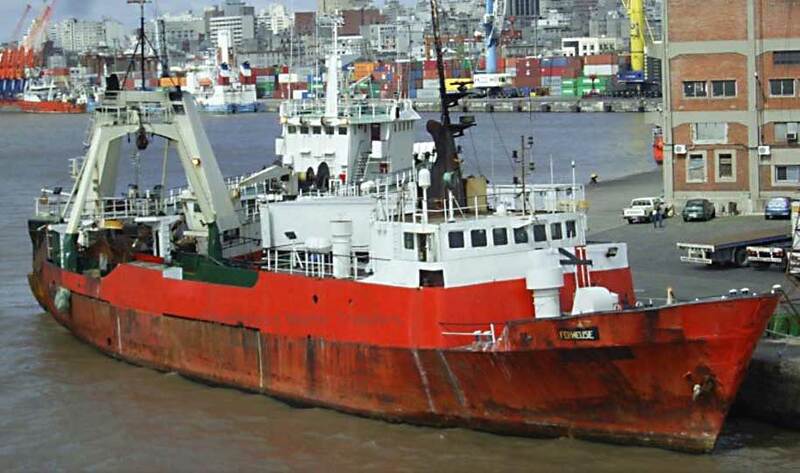 2000: Sold to Frigorifico Pesquero del Uruguay SA (FRIPUR), Montevideo. 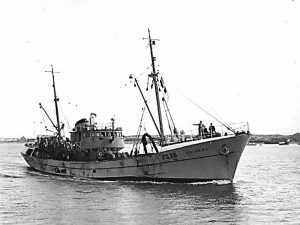 Registered at Montevideo. 2008: Still in Lloyd’s Register. 04/10/2016: Page re-published due to site problems. 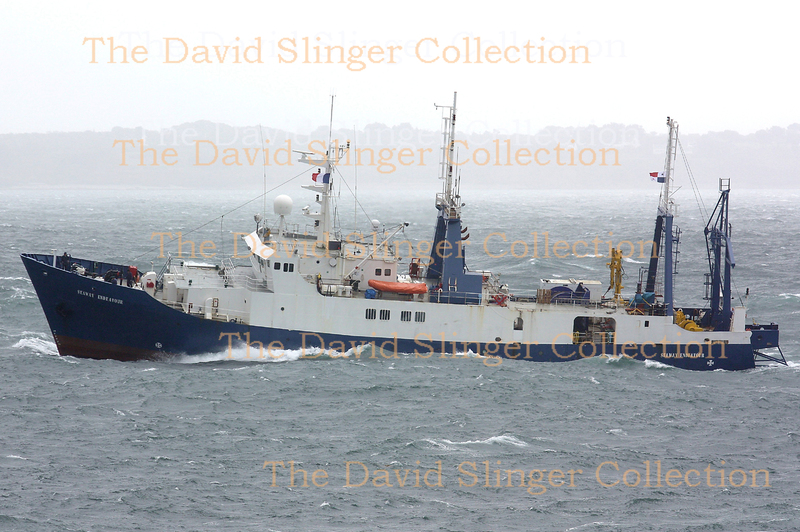 05/07/2017: Removed incorrect image and FMHT watermarks. 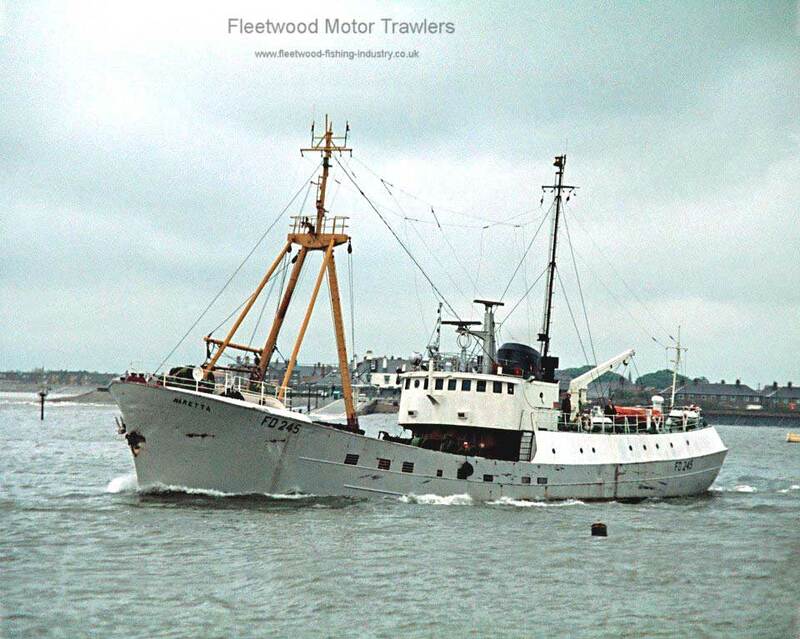 This entry was posted in Marr, Motor Trawler on 4th October 2016 by Howard Small. 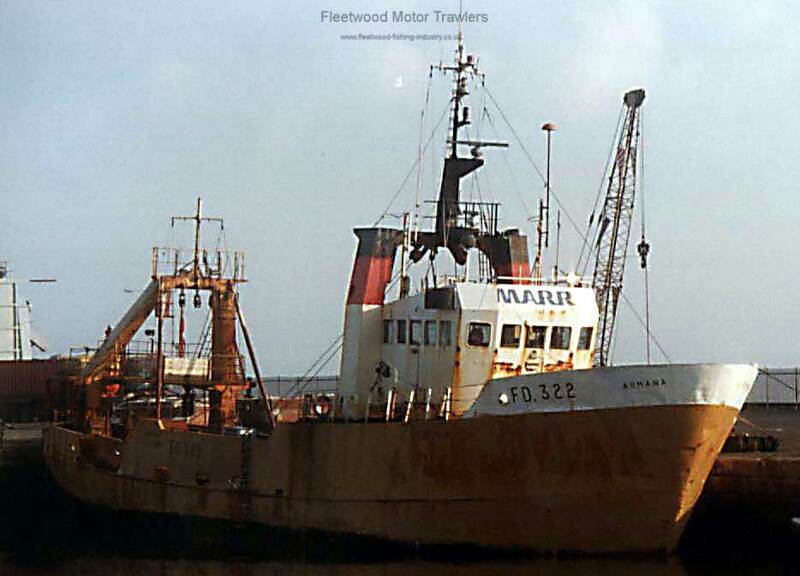 27.4.1971: Launched by Clelands Shipbuilding Co Ltd, Wallsend (Yd.No.318) for J. Marr & Son Ltd, Fleetwood as LUNEDA. 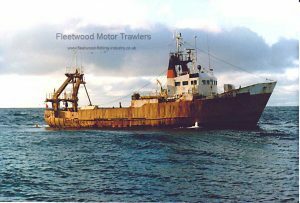 Registered at Fleetwood (FD134). 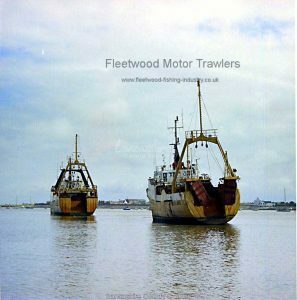 07.1982: All of the company’s remaining Fleetwood based trawlers (8) transferred to fish out of Hull. 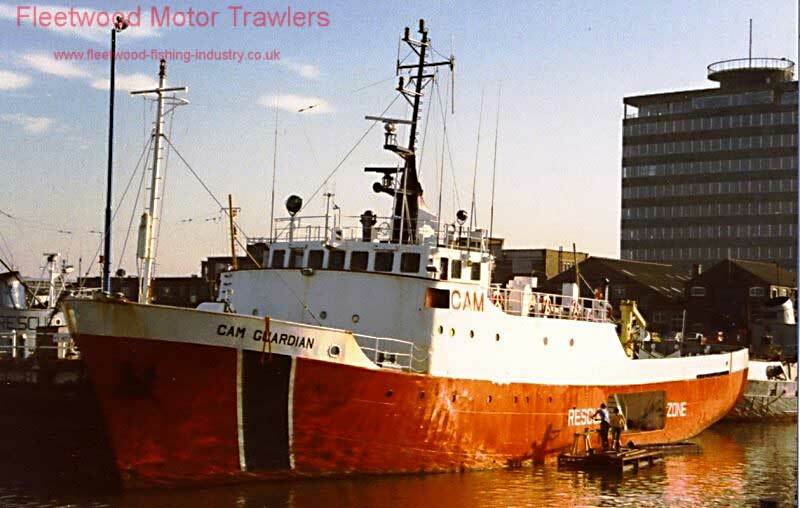 1.1985: Sold along with GAVINA (FD126) and IRVANA (FDFD141) to CAM Shipping Ltd, Hull (J. Marr & Son Ltd, Hull & Others) for conversion to offshore platform standby/safety vessel. 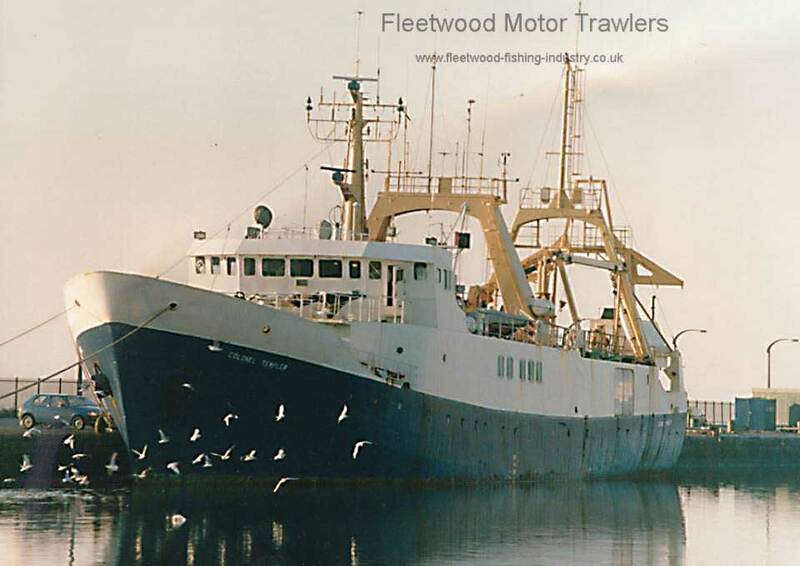 On completion Fleetwood fishing registration closed and renamed CAM GUARDIAN. 1995: Sold to Comlaw No.373 Ltd, London (Viking Standby Ltd, Montrose, managers). Renamed VIKING GUARDIAN. Registered at Montrose. 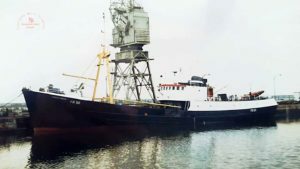 1997: Sold to Viking Standby 3 Ltd, London (Viking Standby Ltd, Montrose, managers). 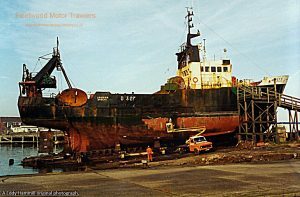 1.9.2005: Sold to Danish shipbreakers for demolition at Esbjerg. 03/10/2016: Page re-published due to site problems. 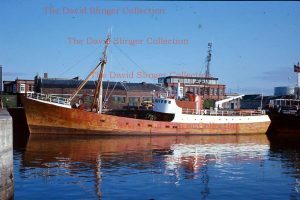 15/06/2017: Added an image and removed FMHT watermarks. This entry was posted in Marr, Motor Trawler on 3rd October 2016 by Howard Small. Cost to build £84,275. 13.02. 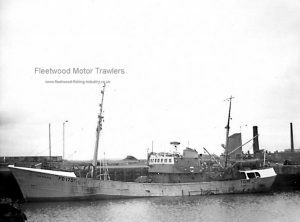 1952: Launched by Cochrane & Sons Ltd, Selby (Yd.No.1376) for J. Marr & Sons Ltd, Fleetwood as LUNEDA. 02.07.1953: Registered at Fleetwood (FD175). 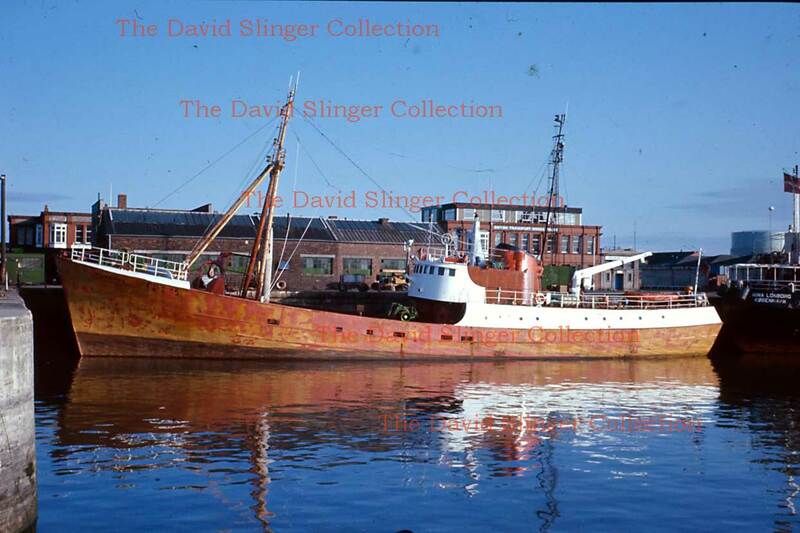 12.1964: Sold to Peter & J Johnstone Ltd, Aberdeen. 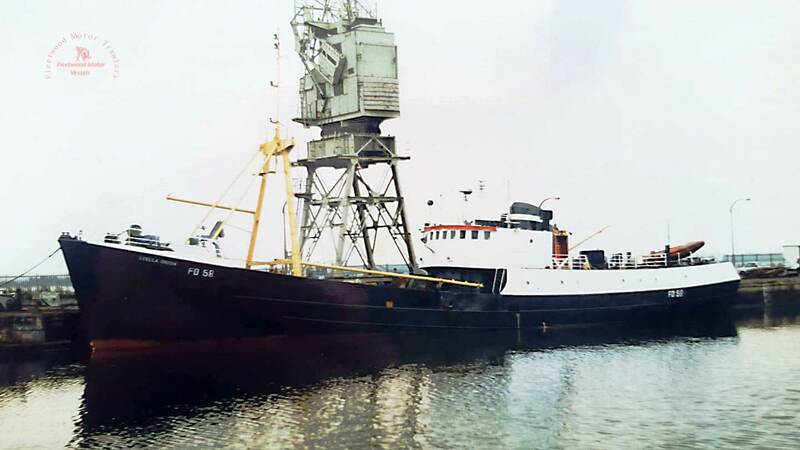 31.12.1964: Registered at Aberdeen (A754). 10.01.1968: Sold to Bon Accord Fish Selling Co Ltd, Aberdeen. 26.08.1970: Sold to P W McLellan, Bo’ness in an en bloc deal with GAVINA (A871). 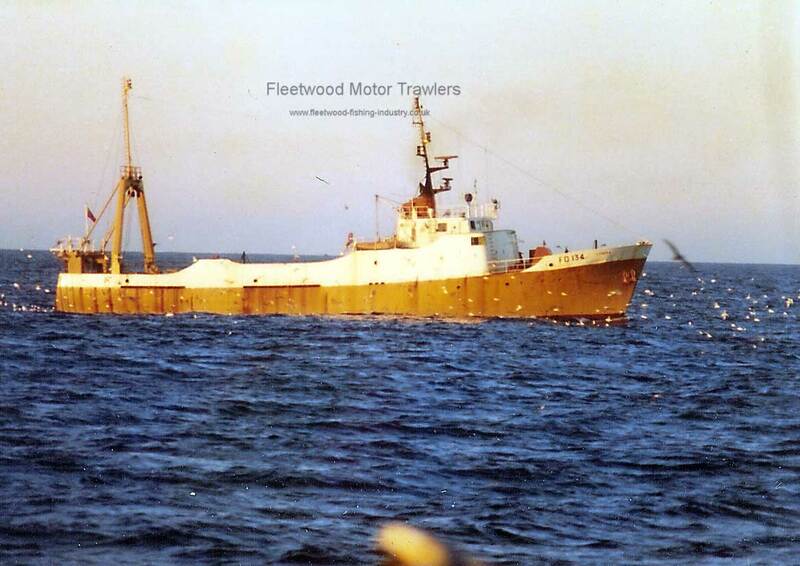 09.1970: Commenced breaking up at Bo’ness. 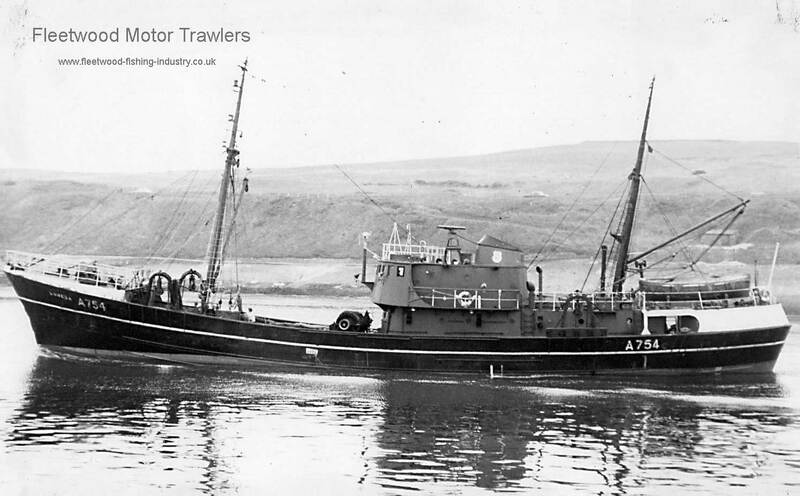 29.10.1970: Aberdeen registry closed “Vessel broken up”.